A decorative alternative to the Fitch Fastener. 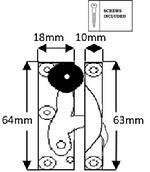 A narrow keep making it ideal for modern double glazed sash & case unit. Supplied with a decorative Black Ceramic Knob.